Some 480 well-wishers cerebrated 30th Anniversary of Masayuki Naito (51) in Tokyo on January 29 for his contribution to baseball community since he started to work with Japan Student Baseball Association after finishing Rikkyo University in 1984. The occasion was for many something like an alumni meeting with current and ex-ball players and executives in attendance across the board. Naito currently serves as Secretary General of Baseball Federation of Japan (BFJ), Japan Student Baseball Association (JSBA), All-Japan University Baseball Federation and Preservation of Aodamo Trees Society. He is one of the key figures to lower “barriers” between amateurs and professionals and promote international baseball. On April 1, BFJ which is a private organization comprising Japan Amateur Baseball Association (JABA) and JSBA will be reorganized to become General Incorporated Foundation. 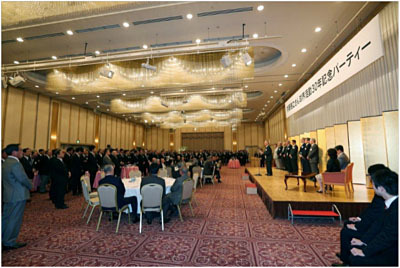 Japan Rubber Baseball Association, the largest baseball bodies in Japan with well over a million members will join the new entity and Eiji Hatta continues to act as President and Naito will be appointed as Executive Director.